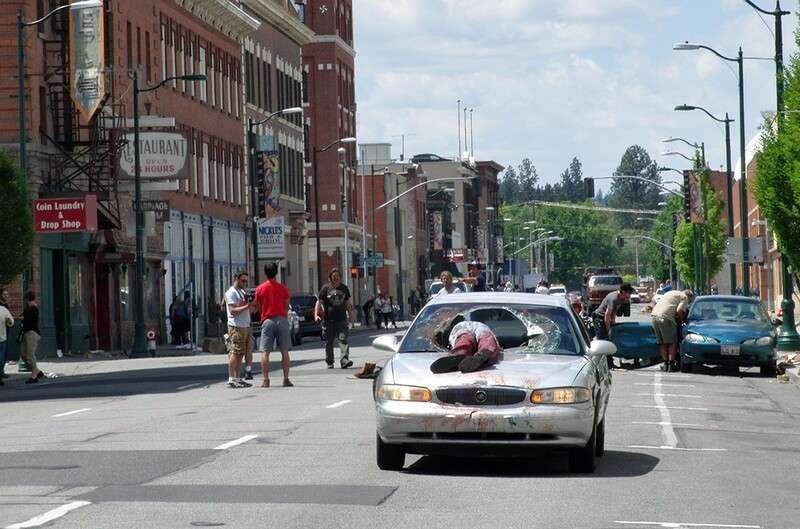 Z Nation filming took place in downtown Spokane during summer 2014. The zombie apocalypse hit Spokane more than a year ago, and it's still making waves across the local film industry. Just this morning it was announced the show is being renewed for a third season, though it's not been confirmed yet if Spokane will again host its filming (more on that below). With principal photography on the Syfy series' second season wrapping up about a month ago, the new episodes are currently airing on Fridays at 10 pm. This week's episode, the season's ninth, debuts tonight, and has a significant local connection. Though Z Nation has employed a sizable number of local experts in the many facets of film, this week's episode is the first to be directed by a Spokanite. Jason McKee has worked on the show as second unit director since its first season. "The reality is the work we did in season one made them interested in making sure more local artists were getting involved in the show," says Juan Mas, McKee's colleague and the director of the following week's installment, episode 10. "It says a lot about the production company and producers to put that much responsibility on local creative individuals and trust us," Mas adds. While you could watch tonight's episode from the comfort of home, the Garland Theater is hosting a special showing of McKee's episode, "Rozwell," on the big screen that also serves as a fundraiser to support the Washington Film PAC. The industry lobby group is working to make sure Washington's film incentive program is renewed after its sunset date in 2017, and also is increased in funds so that series like Z Nation can continue to be made in Spokane and around the Evergreen state. The incentive program allows qualifying productions to apply for cash rebates for choosing to work in Washington state, which offers one of the smallest film industry packages in the nation, capping out at $3.5 million per year. The funding for those incentives comes from a portion of Washington's B&O tax — corporations or individuals can choose to contribute to this fund, getting a dollar for dollar tax credit, up to $1 million. During this year's legislative session, film industry supporters asked lawmakers to increase the pool of funds available for qualifying productions. The request wasn't answered, but groups like the WA Film PAC plan to bring their concerns to Olympia again next year. Read more about the impact of our local film industry and how the film incentives help bring that work here in a cover story published back in summer 2013. Now that we know Z Nation's storyline will continue into a third season, the next question remains — will it be filmed in Spokane again? Mas says the odds are in our favor, but there's no way to guess for sure. Producers are heading back to the region next week to scout locations for the next season. However, Mas says they could have "capped out creatively" with appropriate filming locations in our area. There's also the small state film incentive pool to consider. "The [likelihood they use Spokane] is high, but it is a business, so you never know," he says. "Keeping it on the positive side, season three has been renewed and they're already scouting here to bring it back." Tonight's event, hosted by the Spokane Film Project, begins at 9 pm, and tickets for the screening are available for a $10 donation to WA Film PAC, starting at 8:30 pm.